Deaf West Theatre, North Hollywood, Calif.
“What if” is a sort of intellectual history exercise: What if Lee Harvey Oswald hadn’t killed JFK in 1963? What if astronauts Neil Armstrong and Buzz Aldrin had been stranded on the moon in 1969? What if George W. Bush had heeded that Aug. 6, 2001, CIA memo, “Bin Laden Determined To Strike in U.S.?” What would the world look like today? For those unfamiliar with this seemingly innocuous phrase*, it was uttered by British Prime Minister Neville Chamberlain in 1938 after he sought to avert war by yielding to Adolf Hitler’s demands to carve out a piece of Czechoslovakia for the German Reich. Chamberlain saw it as ensuring peace; Hitler saw it as weakness and used it to cover his re-armament of Germany. Indeed, just a few months later, the Nazi dictator reneged on his promises and plunged the world into war, making “peace in our time” a catch-phrase for appeasement and political naïveté. So what would a German-occupied England have been like 70 years ago? Still the land of the stiff upper lip, bugger all, warm beer, a dog’s breakfast, bangers ‘n’ mash? No matter a temporary setback, there would always be an England, Coward felt, and to make that point in “Peace” he collapsed the nation into a London pub, The Shy Gazelle, and peopled it with recognizable stereotypes. Behind the bar is staunch Fred Shattock (Josh Clark), Shy Gazelle proprietor and pivot for almost all that takes place in the pub, aided by his wife, Nora (Eve Gordon), and daughter Doris (Abby Wilde). They mourn the loss of their son-brother, Stevie (Brian Tichnell), presumed to have been killed while fighting the German invaders. The clientele includes an older couple, the Graingers (Anna Mathias and Philip Proctor), anxious for their son Billy (John Francis O’Brien), captured and imprisoned by the Germans during the invasion. 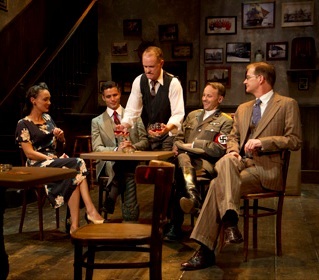 At the next table sit a young, sardonic couple, Lyia Vivian (Rebecca Mozo) and George Bourne (Daniel Bess) who know precisely how far they can go in twisting the tails of two other Shy Gazelle regulars, the Gestapo officer, Albrecht Richter (Rob Nagle), and Chorley Bannister (Bill Brochtrup), a Brit businessman who believes in getting along by going along with the Nazis. A great deal of energy — and wit — comes from Janet Braid (Rebekah Tripp) and Alma Boughton (Ann Noble), two unattached women who are constantly popping in and out of the pub to do verbal battle with Herr Richter and the toady Bannister. Casey Stangl, the director, moves the 22 players along smartly, helped in no small degree by the excellence of the actors themselves. (The Antaeus double-casts the play, so that 44 actors are involved, half on one night and half on the following performance). I would add one more player to the cast, to include Tom Buderwitz’s set. His creation of the Shy Gazelle pub is so spot-on, as the Brits would say, that my impulse, upon entering the house and seeing it in all its glory, was to walk onto the set and order a pint of Guinness. One more interesting note: Barry Creyton adapted “Peace” for its current incarnation, editing out some dated material and adding some Coward songs of that era. That’s not as hokey as it might seem: the actors are all in good voice and the songs range from the cheeky (“Don’t Lets Be Beastly to the Huns”) to the sentimental (“Where Are the Songs We Sung?”) to the emotional (“London Pride.”) Archie (John Allee) accompanies his colleagues very nicely on an upright. All together — book, performers, songs, set, lighting, costumes — it’s a bit of all right and Bob’s your uncle.